Twenty years ago, those of us who longed for physical violence had to either beat each other up in the front yards of our rural houses, as my best friend and I often did, or resort to watching pay-per-view boxing which, while satisfying in the least enthusiastic sense of the word, did not suffice. We needed something more. Somewhere around 1994 (much as Erik Koch’s older brother Keoni finds) we found, those of us who were fight fans, VHS recordings of the first (and 2nd and 3rd) UFC tournaments, in which karate men were pitted against wrestlers, shootboxers against judo practitioners, streetfighters against—well, you get the idea. Fast forward twenty years and us connoisseurs of the martial arts can find fights virtually any time of day or night, rewound and replayed so often the novelty has lost all novel. I have grown tired of the whole fight scene. Dana White rescued the UFC from obscurity, from the clutches of John McCain and others of his ilk who called it a carnival, but 20 years after its salvation, the UFC has floundered back into carnival territory. The fight cards are weak, and they come too often, and the very thing that made fighting great—the rareness of it, the unique nature of the fight itself—has been threatened by sensory overload, too much and too many and far too often. I find it amusing then that a book might have brought me back. In some ways similar to Mailer mirroring Muhammad Ali in 1974 before the Rumble in the Jungle, Kerry Howley—29 years old, a Ph.D. candidate in phenomenology, a term I had to look up, my philosophy education lacking—embeds herself with two fighters, one an aging thirty-three-year-old named Sean Huffman, who prefers smoking pot and eating to working out, but who can still take a beating like nobody in the business, and the other 22 year old Erik Koch—insert adjective, adjective, noun—who is on his way toward the top. She believed, after that first encounter, that fighting could bring ecstatic experience back into the world, so she begins “space-taking,” becoming one of a number of people who take up space around a fighter, their sole function being to insulate fighters against the rest of the world. She attaches herself to Huffman, and later, Koch, splitting time between them, following them to fights, to practices, to restaurants and bars, all the while waiting for the next fight, and moment of transcendent perception. This is the set-up, the intro if you will, the reason for being. What follows is a detailed (and quite gripping) account of the lives of fighters beyond what those of us who watch the pay-per-views ever see. We only see the spectacle—the canned interviews, the bad-mouthing, the arriving at the ring, the flashing lights. Howley, as space-taker, observes the rights and rituals of practice, of dieting, of constant boredom and trouble with family and friends and the struggle to make it in the shadow world of small fights, away from what she capitalizes as Big Shows. What Howley is looking for is the same thing that all fight fans are looking for, although she articulates the desire in a way I never could have twenty years ago, because I had not yet experienced the details of everyday life that so often drag us down and dull our senses. Bored with the academic world, Howley becomes an ardent supporter of the fight, often attacking (verbally) those who deny it without understanding it, explaining that the fight itself can allow us to escape the mundane affairs of our ordinary lives, to step outside ourselves and into the realm of phenomenon. The irony here, one that Howley is fully aware of, is that while she is trying to escape the “limits of perception laid upon [her] by some ungenerous maker,” and reach a transcendence only the spectacle of the fight can bring, her observations become part of the ritual, without which there would be no rise. She spends long hours simply watching, sitting, waiting. She leaves her Ph.D. program. She refuses to return home, devoting all her time to taking space. And take space she does, though her rendering of what might be mundane moments are so stark-clear crisp that they are not mundane at all, but rather the moments that make us what we are, from Sean Huffman fighting not another opponent but fighting to see his child, to Erik Koch’s self-imposed exile from his fighting family. We move from hot, sweat-filled gymnasiums in Cedar Rapids to single cots in dark basements in Davenport; from air-filled January-cold arenas to the lights of Las Vegas. We move from Sean’s struggles to Erik’s enigmatic rise and chance at a title shot, hoping, along with Howley, to experience once again the phenomenon only the fight can bring. 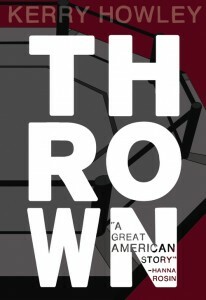 In its darkest heart, Thrown is about three struggling artists (Howley included) trying to make it in a world that cares nothing about them, and will turn on them as quickly as the tendons can tear in a knee jerked sideways. But it is also about the waiting we do in the world, the longing and desire for some higher achievement, some greater understanding. We are always looking for the next fight. Paul Crenshaw’s stories and essays have appeared or are forthcoming in Best American Essays, anthologies by W.W. Norton and Houghton Mifflin, Glimmer Train, Ecotone, North American Review and Brevity, among others. He teaches writing and literature at Elon University.